Below you can view all the homes for sale in the Deer Park subdivision located in North Charleston South Carolina. Listings in Deer Park are updated daily from data we receive from the Charleston multiple listing service. To learn more about any of these homes or to receive custom notifications when a new property is listed for sale in Deer Park, give us a call at 843-306-2224. Over 1.15 acres between the two lots! MLS#17006957. Coldwell Banker Residential Brokerage. This is a Great opportunity for investors interested in investigating the possibility for expansion of commerical or simply to have a well cared for single family home in the heart of the DEERWOOD community. MLS#17006950. Coldwell Banker Residential Brokerage. 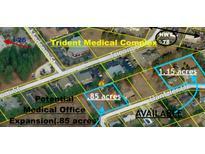 This is a Great opportunity for investors interested in investigating the possibility for expansion of Doctors, dental , speciality clinics as well all medical/professional business in an ever growing Trident Medical Center.PROPERTIES MAY HAVE THE POTENTIAL FOR MEDICAL OFFICE EXPANSIONSNeighboring parcel TMS # 486-06-00-009 behind Cardiologist/Sports Medicine Center available as well,together a .85 acre offering of Prime Potential ! MLS#17006954. Coldwell Banker Residential Brokerage.